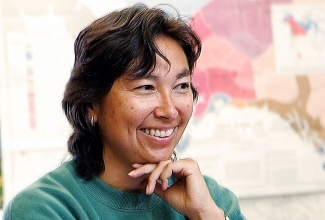 Dr. Deanna Paniataaq Kingston, professor of anthropology at Oregon State University (OSU) and prominent arctic social scientist, died 2 December 2011 at the age of 47. A native Inupiat from King Island, Alaska, Dr. Kingston was a pioneer in exploring the intersections of native traditional knowledge and western science. Dr. Kingston received a masters of arts in interdisciplinary studies from OSU in 1993 and a doctorate from the University of Alaska, Fairbanks in 1999. Her work included research on traditional kinship patterns, songs, and hunting dances. One of her projects, a film collection of last-century King Island life, is housed at the National Museum of Natural History. Her early work was notable for developing a new concept for the way arctic social science could be done, in which arctic communities could contribute through participation in the design of the research, collaboration with scientists on the fieldwork, and assisting in the analysis of the data. Dr. Kingston served on NSF’s Office of Polar Programs Advisory Committee and also on the SEARCH Responding to Change panel. She participated in numerous workshops and conferences including the 2005 workshop, “Designing an Arctic Observing Network," in Copenhagen, Denmark. For further information about Dr. Kingston’s contributions to arctic social science, please see: http://www.nsf.gov/news/news_summ.jsp?cntn_id=122590&org=NSF&from=news.